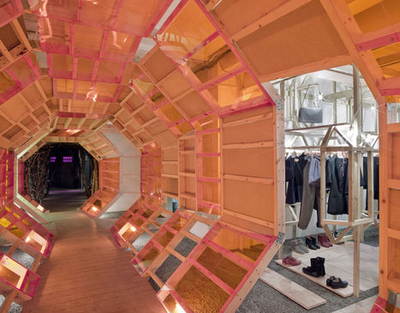 A London boutique has given us our first glimpse of 21st century shopping. LN-CC (aka Late Night Chameleon Café) recently expanded from a virtual space to an actual brick and mortar shop. Well, the terms 'shop' or 'boutique' don't quite describe it as the concept actually includes a bookstore, gallery, photography studio, and music venue. Consider it retail as art instillation. What caught our eye was the future-fabulous architecture and fixtures throughout the space. The concept is a collaborative project by John Skelton, Dan Mitchell, Conor Donlon, Mickey Boyle, and Gary Card. Geometrics, art and music, and a stellar book nook...sounds like a dreamy confluence of science, design, and culture to us.